A comprehensive Encyclopaedia on Indian Astrology comprising a detailed description of the concepts encompassing the various branches of Indian Astrology, Predictions, Combinations, Prasna, Ashtamangalaprasna, Stellar Astrology, Muhoortha, etc. More than 300 articles, 15,000 words relating to Indianj Astrology, 300 tables of various astrological data, comprehensive and exhaustive information on Prasna and Ashtemangala branch of Indian Astrology, different systems of Indian Astrology, Combinations based on various astrological concepts extracted from Indian classics on Astrology in Sanskrit like Parasara hoara, Jathakapaarijatja, Brihathjathakam, Varahahoara, Saaravali, Krishneeyam, Prasnamarga and Tamil classics on Indian astrology. The well edited articles on various branches of Indian Astrology, various planetary combinations and possible predictions based on these planetary positions and other aspects are dealt exhaustively in the encyclopaedia. The various astrological combinations and their results enable the easy prediction of astrological results. More than 10000 combinations analysed with prediction. Most Exhaustive reference book on Indian Astrology released to date. Absolutely essential reference book for every Indian astrologer, learner and the practitioner. Prof. N.E. Muthuswamy, (1925-2005), an eminent scholar Astrologer, has written exhaustive commentaries for Saravali in 6 parts, Brihathparasarahoara in 2 parts, Utharakaalamritham in 2 parts, Prasnanushtanapadhathi in 2 parts, Prasnamarga in 6 parts, critically edited with text and commentaries, and more than 60 books on Indian Astrology in Malayalam on various aspects of Indian astrology. His books in English, Ashtamangalaprasna, Course in Indian Astrology, Gulika in Astrology, Krishneeyam have been well received. He has rendered in audio format, Sanskrit classics on Indian astrology, the Prasnamargam, Jathakadesam, Phaladeepika, Varaha Hoara, Krishneeyam, Muhoorthapadavi, Saravali, etc. 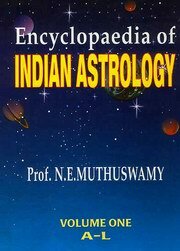 Prof. N. E. Muthuswamy, was known in astrological circles in Kerala as the Upakulapathi of Indian Astrology. He has been ardently promoting the learning of Indian astrology among the various sections of Kerala for the last 20 years and he had a large student base. He had organized more than 60 Seminars on various aspects of Astrology at Different places in Kerala and was well known as an educationist propagating Indian Astrology. He organized several All India Astrological Conferences at Trivandrum and were well attended by scholars from various parts of the country. He had also presented several papers on various seminars organized by different organizations all over India. An active member of the Indian Council of Astrological Sciences he headed the Kerala chapter of the ICAS.